The cuisine of Ukraine along with its language, literature and music has a rich historical heritage which Ukrainians are immensely proud of. Many different traditions and historical events have influenced the formation of the Ukrainian cuisine. That’s why there is a large number of recipes borrowed from German, Polish, Hungarian, Tatarian cuisines, and more. 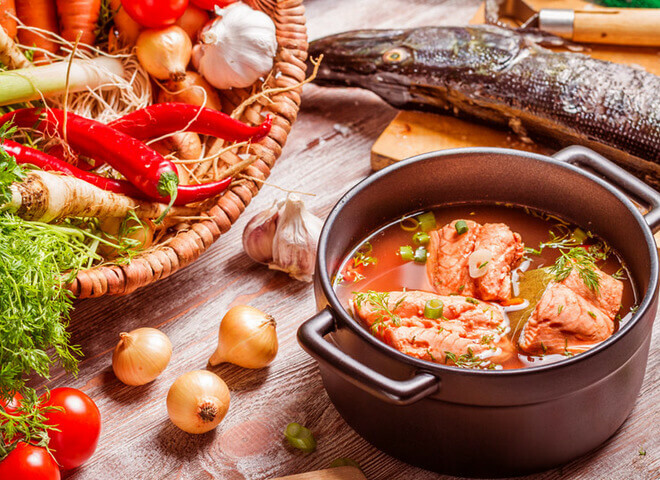 All adapted dishes “settled down” in Ukraine so much that today Ukrainians rightfully consider them an integral part of the Ukrainian cuisine. Let’s make a culinary trip to different corners of Ukraine. Fliaky came from Poland. 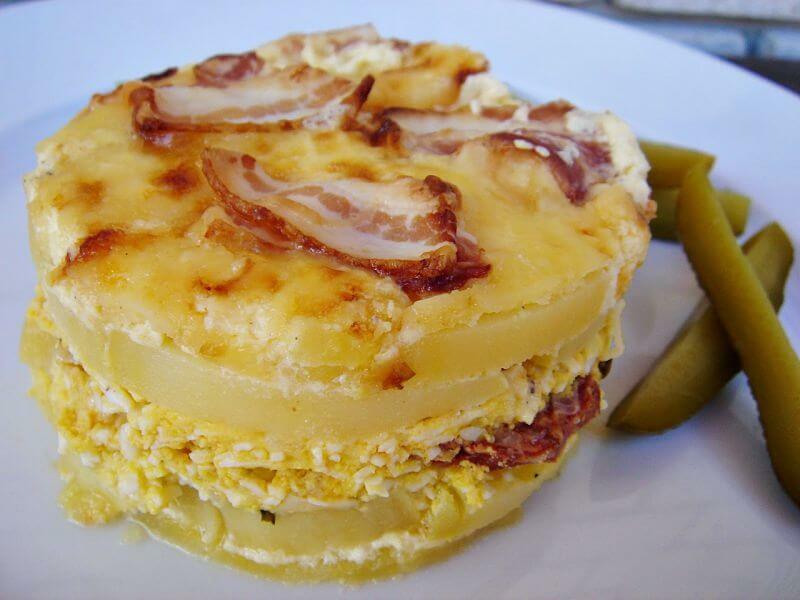 Now this dish is widespread in Halychyna. It is the soup which has bible tripe as the main ingredient. Thanks to excellent nourishing properties and bright taste peculiarities this dish is in favor. You’ll be surprised how much energy you get after eating this flavorful broth. 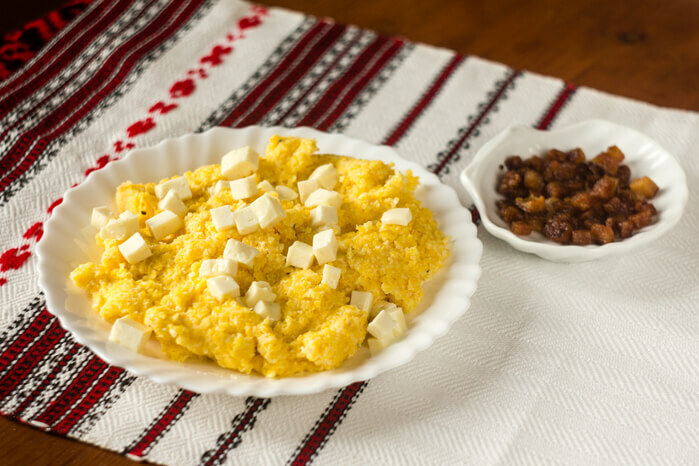 Banosh is a traditional dish of the Halician cuisine, which represents dense cornmeal mush boiled in cream or sour cream. By tradition, this dish can be cooked on an open fire and only by a man (using a cooking pot and stirring with a wooden spoon). There are many discussions concerning the origin of this dish, but most of them lean towards the fact that knyshi have Belarusian origin. 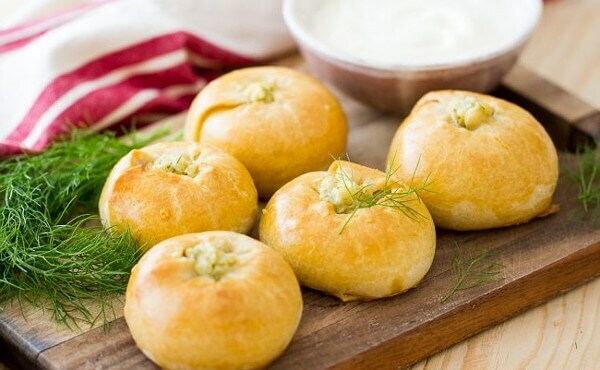 Knyshi are rounded patties (buns) cooked using thin puff pastry. They gained popularity thanks to rich and diverse fillings. The most widespread stuffing is buckwheat with onion and cracklings. Knyshi can be also stuffed with jam, cheese, or berries. Among other “hearty” fillings are mashed potato and cabbage. Knyshi are mostly served as an addition to hot or meat dishes. 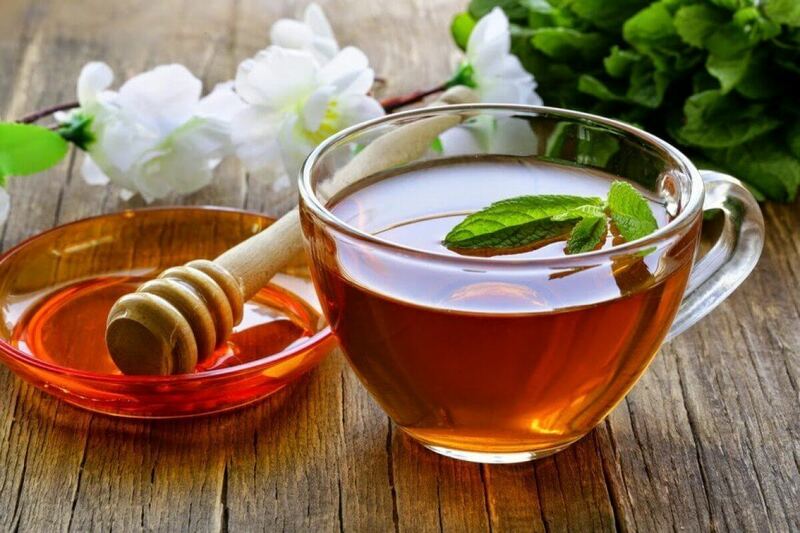 Zbyten is the old Slavic drink that was popular and widely loved by people long before the tea appeared in Ancient Rus. This drink is no less than 1000 years. The first samovar (a metal container that it used to heat and boil water) was used to cook zbyten, and only afterwards was utilized for making tea and other drinks. Zbyten is made using honey, herbs, and spices. This drink is considered to be rich in vitamins. It also has a tonic and curative effect. It can be alcoholic and non-alcoholic and can be served both hot and cold. 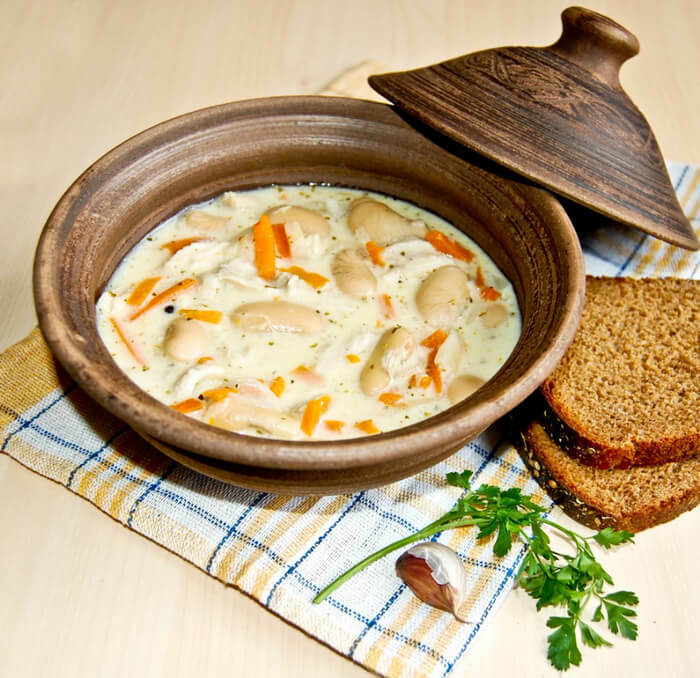 Mezhyvo is one of traditional Ukrainian dishes from the earliest times. This appetizer is tasty both hot and cold. It represents something between a paste and ragout. The most common selection of ingredients includes a beetroot, zucchini (marrow squash), pumpkin, and tomato. A bulb onion and a carrot are always added to these main components. 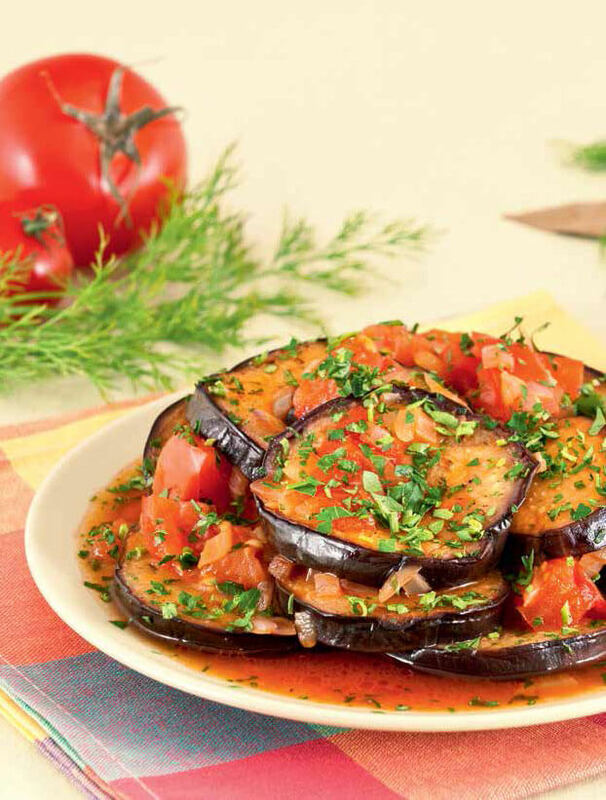 In Ukraine aubergine (eggplant) mezhyvo is also highly popular. If you put this dish in a fridge for a couple of days, it’ll become tastier since veggies will be able to fully marinate. The fruit options of this dish are also available. In translation from Hungarian language bohrach is a cooking pot, and since the pot is often used in outdoor trips - its recipe “traveled” from one village to another. In order to get perfect bohrach, you should cook it the same way as Ukrainian ancestors did - in a cooking pot on an open fire. 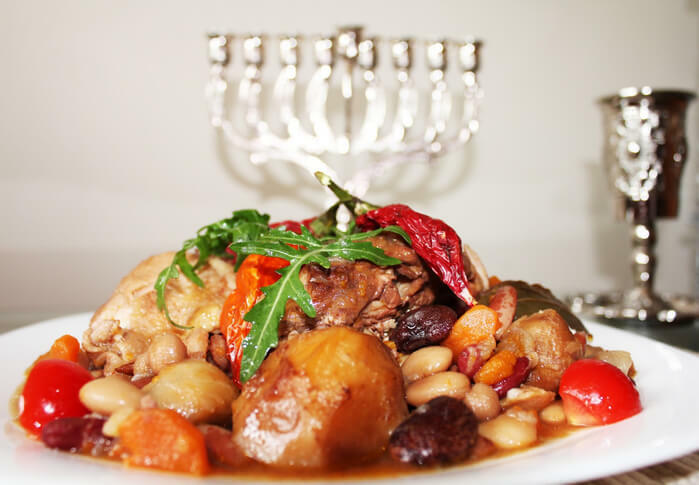 Chovlent is a traditional Jewish dish made using meat, haricot, groats, and veggies. The dish was cooked in a pot in a stove oven. Inventive Ukrainians borrowed this recipe and transformed it in a usual everyday dish, making some modifications. 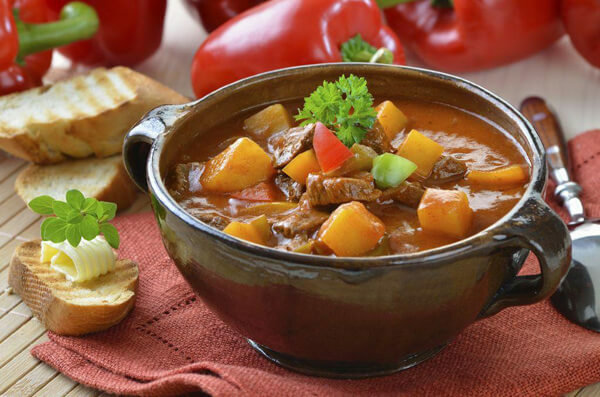 Today, in order to cook this dish, Ukrainians use any kind of meat and always add hot pepper. It is believed that the yummiest chovlent is made using smoked ham or spareribs (you can also add garlic for some piquancy). 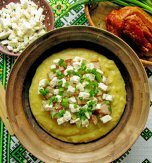 Mamalyha is a national Moldavian dish – cornmeal mush boiled in a cauldron. 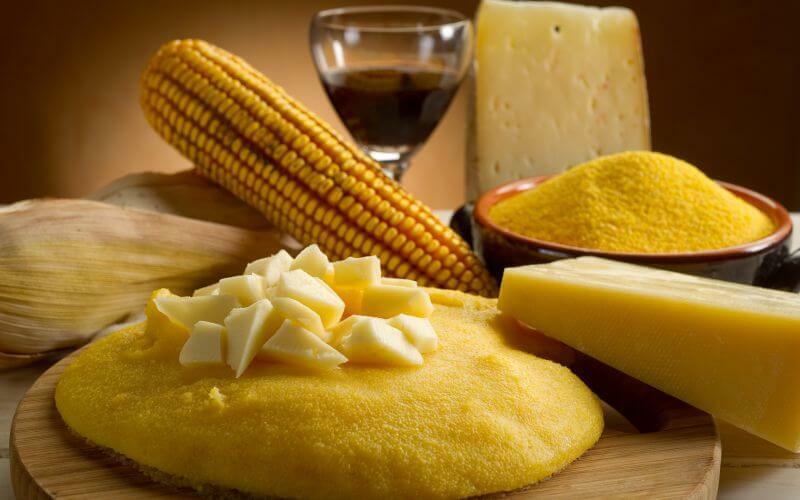 At first this dish was made using millet, but when in Moldavian fiefdom maize fields began to expand, then millet was substituted with corn. Moreover, corn wasn’t laid under tribute by Turkish occupants. Historically the main food of country folk was mamalyha which was used instead of bread. In order to cut this dish people used a waxed thread or a special wooden knife. Rokot krumpli is one more dish adapted from Hungarians. 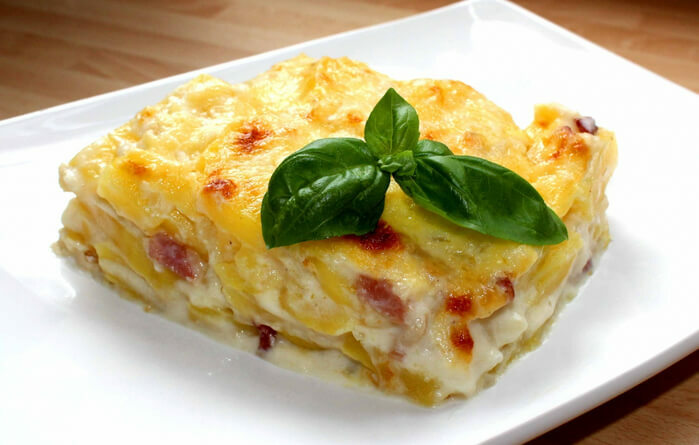 It’s worth to mention that the Hungarian cuisine is rich in recipes for different vegetable casseroles. In translation rokot krumpli means potato baked in layers. 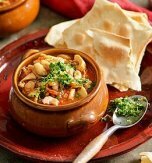 The recipe for this dish is very easy and its taste will hardly leave anybody cold. To cook rokot krumpli you will need potato, eggs, cheese, smoked sausage, and, of course, ground red pepper. 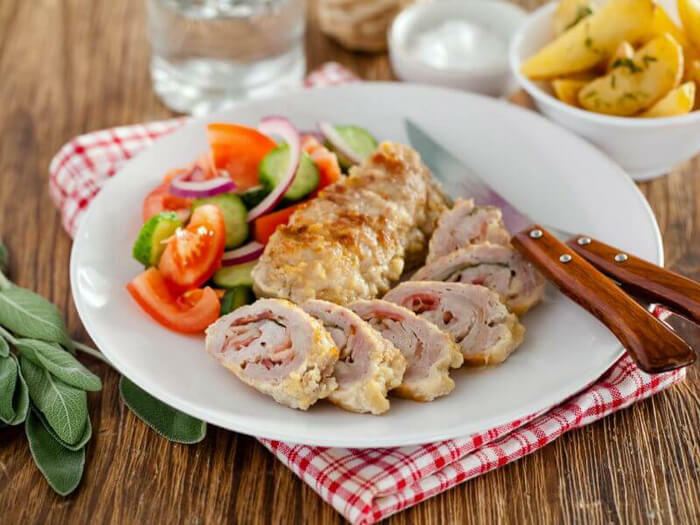 Tokan has come from the Romanian cuisine and has fairly become one of the most favorite dishes. 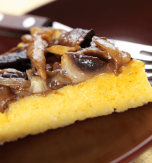 This dish is often confused with mamalyha (cornmeal mush on its own). In the meantime, tokan is cooked using pork and served together with cornmeal mush. Over the years, this recipe was modified and now is served in such a way – a layer of cornmeal mush, a layer of brynza, then a layer of cornmeal mush again (the number of layers depends on the amount of mush). Fried pork or cracklings are put on top. Kruchenyky or zavyvantsi are a traditional Ukrainian dish which is widely popular in the Carpathian region. 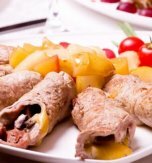 Kruchenyky represent meat or fish rolls with a veggie/mushroom (or even dried prune) filling. A small amount of ingredients is used to cook this dish, but the result is amazing. This starter is primarily served hot, but cold zavyvantsi are also yummy. 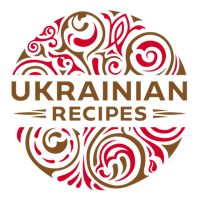 Have you liked the article about one-of-a-kind Ukrainian recipes?